EV maker producing prototypes this fall. Tesla's Model X will start rolling off the production line next spring, according to a letter from the company to those who put down deposits on the crossovers. 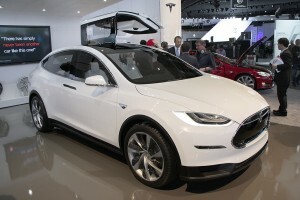 When it’s not discussing the possibility of producing a submersible car or one that can fly, Tesla Motors reminds people that it produces real-world vehicles, in this case, it recently told potential owners of the Model X that the crossovers will begin rolling off the production line in early 2015: a little sooner than anticipated. In a letter to people who have put down $5,000 deposits on the EV maker’s next addition to its line-up, the company said it would begin building prototypes this fall and the road-ready models would be available in the first half of next year. Tesla has been pointing to sometime next year as the plan for the next vehicle in its portfolio – the others been the couple and Model S – which is also expected to include an affordable sedan sometime after 2016. The news comes as the Palo Alto, California-based company saw the New Jersey State Assembly take another step toward allowing Tesla to sell vehicles there. The maker sells its vehicles directly to consumers, which violates laws in many states that require auto manufacturers to use dealers to sell vehicles: New Jersey being one of those. However, a bill introduced into the assembly earlier this year, would allow direct sales of electric vehicles. The legislation passed and now heads to the state senate for a vote, where it is expected to pass. The commission, an eight-member body consisting of members of Republican Gov. Chris Christie’s cabinet and other gubernatorial appointees, blocked Tesla Motors from direct sales in March. Elon Musk, Tesla’s founder and CEO, has been wrestling with states with strong pro-dealer laws to change those laws to allow his company to sell direct to customers. He’s maintained that a company like Tesla cannot survive within the framework of the franchised dealer system. Some states have revised their laws to allow for direct sales under limited circumstances, such as electric vehicle manufacturers. This entry was posted on Tuesday, June 17th, 2014 at and is filed under Automobiles. You can follow any responses to this entry through the RSS 2.0 feed. Both comments and pings are currently closed.